Families: Click here to find out what your visit will be like. The Brain Development Lab at the University of Oregon uses decades of research on neuroplasticity and child development to create and empirically test programs that create connections between children and their parents. We use brain imaging (EEG and MRI) in children and adults to understand how successful interventions may be changing brains. 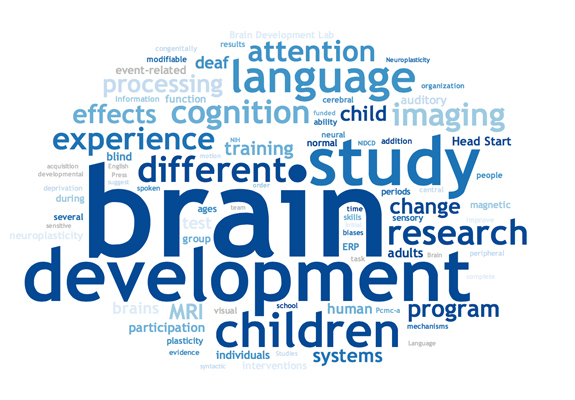 The Brain Development Lab, founded by Helen Neville, Ph.D., includes a team of neuroscientists, psychologists, teachers, graduate students, and many talented undergraduate and post-baccalaureate students. Click here to find out more about our team of scientists, teachers, researchers, and assistants. Click here to find out more about your visit. Click here to find out more about our team of scientists, teachers, researchers, and assistants. Click here to find out more about an MRI session. Click here to find out more about brains and our outreach efforts. The size of the words in this diagram represent the number of times a word is used on our website.